Posted September 21, 2018 by Bailey Heard & filed under Blog, FeaturedOnHomePage. 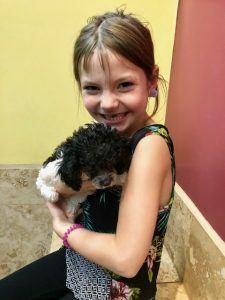 Last weekend, I made the major mistake of taking my 7-year-old daughter, Ellie, to Pet Land. Pet Land is a pet store where you can purchase adorable puppies and other pets. The dangerous part is they let you take the dogs out of their crates and play with them in a private room. I’d learned about Pet Land from a family I’d babysat for back in the day when my late husband, Andrew, and I lived in Dallas. These precious twin girls would always beg me to take them to Pet Land so they could play with the puppies. We had a blast! It’s also the place where my parents purchased our 3-year-old mini Golden Doodle, Keller. Let me preface how I ended up at Pet Land by saying when I’m tired and my brain is foggy, it’s a slippery slope from there. That’s how it all began. It had been a wild couple of weeks. Ellie got strep throat, so we were homebound for a few days. Then I misunderstood the doctor’s directions and forgot to give her the entire bottle of antibiotics, so it came back and she had to miss more school. Lesson learned. I think being homebound for that long kind of diminished my willpower, along with some other things going on in my personal life that were mentally and emotionally draining. I can tell when my will power gets low because I start mindlessly spending money and eating food that’s delicious, but not necessarily healthy. Afterward, I feel terrible, and those were the types of choices I was making last weekend. On Saturday night, Ellie, sensing my lack of willpower, started asking me for another dog. Now let me be clear, we do not need another dog. We almost didn’t keep the dog my parents’ gave us because I felt overwhelmed just being a single mom. I’m only now in a really good place of feeling like I can take care of myself, my daughter, and our dog, Keller. Plus, dogs are an ongoing financial commitment. And despite Ellie always telling me she’ll take care of the dog, I know who’s really going to do all the work. To be honest, I’ve just now recovered from the puppy phase. All this to say it would be a big decision for us to add another dog to the fam. Ellie, however, cares about none of these points, because dogs are her passion in life, all she thinks about, talks about, and all she’s ever wanted. Thus, by the 100th time of begging me for a dog, I took a nose dive at a very weak moment into the black hole of the internet to look up her current puppy of choice, a teacup yorkie. We spent hours scrolling through breeders’ websites, and the more we saw, the more hopeful Ellie became. I should have cut it off there, but…nope. After hours of her begging me for a dog, I lost all my will and agreed to go to Pet Land to play with puppies the next day. I did not commit to us getting one, but I also didn’t say we weren’t. So Ellie took the little hope she had and ran with it all the way to Pet Land. From the moment we entered, I knew I’d made a big mistake. My gut feeling was confirmed even more when she fell in love with a toy poodle that she played with for an hour and begged me with every ounce of her being to get. Thankfully the price of the dog was so beyond our budget it wasn’t even realistic, but that fact didn’t stop Ellie from crying crocodile-sized tears the entire way home, telling me she’d never meet another dog like that one, that she’d never have a connection with another dog the way she had with that one, and so on and so forth. Her pain broke my heart in half and I was kicking myself for letting the situation get this far. I knew I should have shut the search down way before it got to this point. Seeing Ellie so heartbroken made me want to turn the car around and go get the dog that we couldn’t afford, and didn’t need, and honestly, I almost did. Luckily, the Pet Land employee we’d talked to texted me that night to inform me the toy poodle found a home. I thanked the Lord for getting me out of our predicament. To my dismay, El took the news pretty well, which only confirmed my suspicions she was probably playing me like a fiddle. I didn’t respond to the text, but I thought about it. The next day I realized, in this particular instance, I felt guilty I couldn’t give Ellie a “normal” life, like a Dad or siblings, and that the only thing I could offer her at this point was possibly a dog, which happened to be the thing that makes her the most happy. After admitting this to myself and to my friend, I stopped beating myself up and had compassion for myself, because I could see I had good intentions. I also saw the lie in my thinking and realized trying to give her things to fill a void is not the answer to our pain. The answer is love. Love is the gift I’ve been giving her from the beginning and it’s all that truly matters. I don’t need to compensate for the fact her Dad died, all I need to do is love her unconditionally. I learned a lot from that experience and I’m curious if you’ve been in a situation like this one. If so, what did you learn about yourself and what did you take away from the experience? Looking forward to hearing from you! Thank you so much for taking the time to read and to share. Love and Blessings. 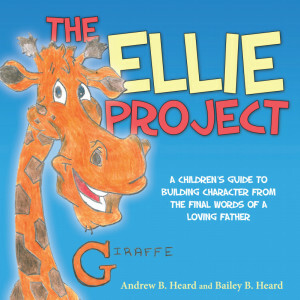 PPS – If you’re looking for a great kids birthday gift, I’d recommend my late husband Andrew’s book, The Ellie Project! It’s full of fun and colorful pictures of animals and life/character lessons. You can find it at www.ellieproject.com. Hope you love it as much as we do!